#1 - Clark Marriott Hotel: Experience five-star hospitality at Clark Marriott Hotel. Their well-placed hotel is located in the vibrant central business district of Clark Freeport Zone, Mabalacat, Philippines - just minutes from Clark International Airport, shopping, dining and entertainment. As the only five-star accommodations North of Manila, their hotel offers 260 rooms and suites with contemporary design and deluxe amenities. 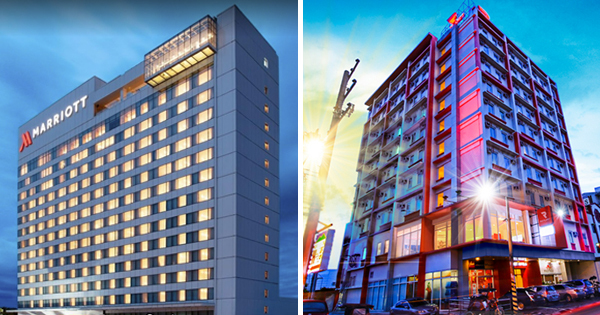 #2 - Park Inn by Radisson Clark: Boasting 154 rooms and spacious suites with vibrant decor and chic furnishings, the Park Inn by Radisson Clark provides a welcoming hotel experience less than eight kilometers from the Clark International Airport (CRK). During your stay, enjoy easy access to Clark Freeport Zone and the SM City Clark Mall complex, both located next to the hotel in Angeles, Pampanga. #3 - Red Planet Angeles City: Located right in the heart of Angeles City, serving as the tourism and business hub of the city. Traveling for business or leisure has never been this convenient as the hotel provides easy access to all points of interest that this developing city has to offer. All it takes is a 10-minute drive to get to Bayanihan Park, Fontana Leisure Park, and Mimosa Golf Course. #4 - Xenia Hotel: With a warm and inviting ambience, the 200 air-conditioned rooms of Xenia Hotel in Clark, Pampanga are guaranteed to make you feel as if you’ve never left home. All are spacious and cozy, perfect for solo travelers, couples, families on vacation, or the executive on a business trip. A veranda offers stunning views of the lush greenery outside, giving a sense of calm and tranquility. Blackout curtains provide privacy when needed. #5 - Lewis Grand Hotel: For years, The Lewis Grand Hotel has upheld its recognition as one of the prime Angeles City hotels near Clark International Airport. Nestled between the dazzling streets of Fields Avenue, the hotel offers a remarkable taste of hospitality to its local and foreign guests. The Lewis Grand Hotel redefines the right fusion of entertainment, culture and exclusivity to everyone who seeks a lavish getaway.